It often seems as though our minds are racing with thoughts. We may feel scattered, pulled in many directions, our thoughts swirling out of control. This feeling is especially prevalent in today’s culture, as we are constantly bombarded by news, messages, advertisements, and updates. A good way to bring harmony to body, mind, and spirit is with a grounding practice, which will level the playing field between heart-connected intuition and near-frantic overthinking. 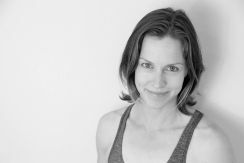 In a grounding practice, you can focus on finding and nourishing your true center in the hara—the earth center in the body, which is located in the low belly, according to the Japanese meridian system. Because long holds facilitate grounding, yin is a wonderful choice when that is your intention. This practice is designed to promote grounding and resilience to stress, increase energy and vitality, and replenish stores of patience. It takes about an hour, and you’ll need one to three blocks and one or two large bolsters, as well as a blanket or two and an eye pillow for savasana, if you’d like. An article I read about tea rituals around the world inspires this meditation. As an avid tea drinker, I was intrigued to learn that traditionally, in many parts of China, teacups weren’t filled right to the brim. Rather, tea was poured until the cups were about 70 percent full. The other 30 percent was space for emotions. This immediately struck a chord with me because it reminded me of a yin practice. In yin, we don’t go to the most extreme level of stretch or sensation in a pose, but only far enough to be conscious of the experience—to perhaps 70 percent of our capacity. And then we have the remaining 30 percent of our capacity as space in which emotions can arise during our practice. For this meditation, sit in a comfortable seat and notice your sitting bones grounding into the earth. Let your hips and legs relax and be heavy and at ease. Close or soften your eyes and start to become aware of sensation in your body. Notice your belly rising and falling with your breath. Then imagine that you have just brewed a cup of your favorite tea. As you take a deep breath in, smell the aroma—what kind of tea did you choose? What flavor notes can you pick out? As you exhale, imagine that you are gently blowing on the tea to cool it off. As you inhale again, appreciate all the different scents of the tea and the way the warm cup feels in your hands. As you exhale, imagine that your breath creates ripples in the surface of the tea. Continue to breathe in and out, visualizing the warmth and comfort of that cup of tea. Remember: The cup is only 70 percent full; the rest of the space is there to receive your emotions. After five minutes, open your eyes. From your seated position, move onto all fours. Take your knees as wide as is comfortable and release your hips toward your heels. Bend your arms and take hold of opposite elbows with your hands, bringing your forearms to the ground. Rest your forehead on your forearms or on a block. Stay for three minutes. You can remain here, or take the pose further: extend both arms straight out in front of you and then bend your elbows, keeping them on the mat or placing them on blocks, and bring your hands to your upper back. Regardless of how far down your back your fingertips reach (or don’t), don’t force it. Make it your intention for energy to flow from your fingertips to your hips. Rest your forehead on the floor or on a block. Stay for an additional two minutes. Let your sitting bones sink closer and closer to your heels, gently giving in to the pull of the earth’s gravity. To come out, extend your arms, then walk your hands back until they’re under your shoulders, bring your knees hip width apart, and come back onto all fours. From all fours, walk your hands out in front of you as far as you can and allow your heart to melt toward the mat, keeping your hips stacked over your knees. With your right arm extended, bend your left elbow and place your left hand on top of your right arm just above the elbow. Rest your forehead on your left forearm or on a block. You can turn your head to the left if it feels okay for your neck. Feel your heart center melting, drawn toward the mat by the grounding forces of the earth. Stay for two and a half minutes, then switch sides. After holding for two and a half minutes on the second side, extend your right arm and bring both hands back under your shoulders, returning to all fours. From all fours, inhale to release any tension from your belly, letting it be soft, as you lift your tailbone and heart away from each other and turn your gaze forward. Exhale to draw the navel toward the spine, rounding your back and gazing toward your legs or belly. Repeat cow and cat for a total of five breaths, and then return to a neutral spine. Then bend your torso to the right as if you’re trying to bring your right shoulder to meet your right hip. Feel the openness of your left side and look over your right shoulder, allowing the stretch to extend through the left side of your neck. Switch sides. Repeat four more times on each side for a total of five on each side. After the final stretch, move into stillness on all fours and notice the grounding down of your hands and knees. Feel the aftereffects of the movement in your body: Where do you feel the blood and energy moving? Where do you feel the most anchored? How does stillness feel after movement? Walk your hands forward and come onto your belly. Choose the variation of sphinx pose that provides you with a slight feeling of compression in the low back, but nothing too intense. Option 1: Elbows out to the sides, hands stacked, forehead resting on folded hands. Option 2: Elbows under shoulders, forearms parallel to each other, neck in line with spine or head released. Option 3: Like option 2 but with bent knees, heels dropped toward the hips. Option 4: Seal pose. From option 2, turn your hands out so your fingertips point toward the top corners of the mat. Straighten your arms. Whichever variation you choose, imagine that you are on a windswept, rocky island. You unroll a thick, cushiony mat on the surface and come into your sphinx. The rock has been thoroughly warmed by the sun, and you can feel the heat radiate up through the mat to your body. The warmth is soothing and makes your muscles and tissues feel as if they were melting into the earth. Imagine how stable and solid that rocky surface feels, and notice some of its details. Can you pick out the different contours of the island, veins of color running through the rock, the various shades of green represented by moss, lichen, and plants growing at the water’s edge? Feel fully supported by the earth beneath you. Notice how it feels to breathe deep into your belly, pushing against the earth and guiding your breath to expand your back ribs. Stay for five minutes and then come into option 1, if you are not already there, for another minute. Then bring your hands under your shoulders and push up to sit on your heels. Drop your hips to one side, extend your legs out in front of you, and then open them into a “V” wide enough that you feel a slight stretch along your inner thighs. Reach the crown of your head to the sky and your sitting bones into the earth. Allow your pelvis to tilt forward and down, and walk your hands forward until you have reached your 70 percent. At that point, allow your spine to round. You can drop your head if it is comfortable to do so. Allow your knees and ankles to be soft. Start to direct your breath deep into your belly—the hara, or earth center, of your body. Feel supported by the ground. Imagine your vitality and resilience being rejuvenated. Practice acceptance of where you are in the pose and also in your life, thoughts, and emotions. Consciously release any holding in your hips or legs. Stay for four minutes and then reach through the crown of your head and walk your hands back toward your body to return to vertical. From there, turn your heart to face your left knee and fold over your left leg, with one hand on either side of it. When you experience a stretch, allow your spine to round. You can release your head partly or completely. Close your eyes if you feel comfortable doing so, and refocus your breath into your low belly. Consider visualizing a scene from nature that you find particularly calming—maybe a lake, ocean, mountain range, or forest. Imagine breathing energy in with each inhale and storing energy in your center with each exhale. After four minutes, reach out through the crown of your head to lengthen your spine and lift back up to vertical. Turn your heart to face your right knee, framing your right leg with your hands, and fold until you experience sensation. Practice acceptance again as you breathe here for four minutes. To come out, reach through the crown of your head to lengthen your spine and come back to vertical, facing forward. Slide your hands under your knees to help bend them so you can come into an easy sitting position. Build a bolster ramp: Place a bolster toward the back of your mat and then place a block on its low or medium setting under and about a third of the way down from the top of the bolster. Recline so that the bolster ramp supports your spine and the back of your head. Bring the soles of your feet together, with your heels one to one and a half feet away from your hips, and let your knees fall open to the sides. If you’d like, you can place additional blocks under your upper thighs or knees, or use a bolster to support your thighs and lower legs. The goal is not to cushion the legs so much that there is no sensation; rather, you want to feel some stretch, but not too intense—remember, 70%. Allow gravity to gently work on your legs, drawing your knees, thighs, and calves ever closer to the ground. Release any gripping of the muscles to allow this pose to achieve the goal of yin, which is to go past the muscles to the connective tissue. Imagine inhaling nourishing vitality and softening more and more with each exhale. Allow your upper body to be completely supported by the bolster. Your hands and forearms can rest on your belly or on the floor. Allow your lower body to feel completely supported as well. Stay for 10 minutes, and then draw your knees in toward each other, placing the soles of your feet back on the mat. Then take each foot to the edge of the mat and move your knees from side to side in windshield wiper pose. To come out of the pose, turn to lie on one side and use your hands to press the floor away and ease yourself up. Remove the bolster ramp. Lie down on your back and hug your knees into your chest. Allow the muscles of your legs and hips to relax. Rock from side to side or back and forth, depending on what feels good to you. Feel the ground supporting and grounding you. 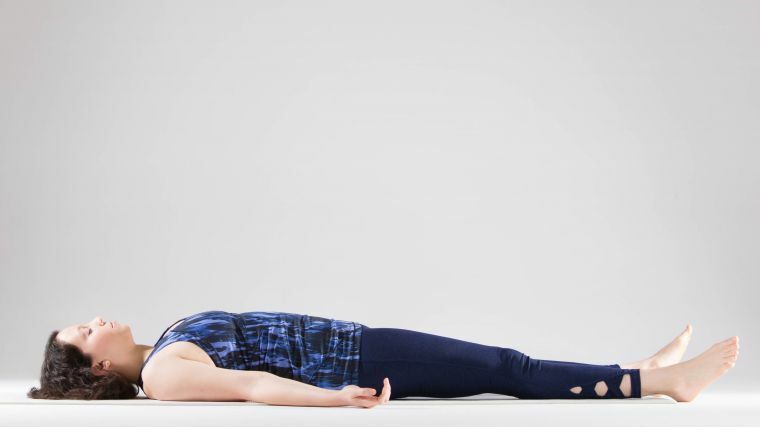 After two minutes of movement, rest with your knees hugged into your chest in stillness for one minute, and then fully extend your legs on the floor and your arms alongside you in preparation for savasana. Take the feeling of grounding that you've cultivated into your savasana. Let your entire body feel heavy, joints loose, muscles languid. If you like, for even more grounding, you can place a folded blanket on top of your lower belly and pelvis or use an eye pillow. Stay for 10 minutes or longer. Maybe after savasana you can brew and drink that cup of tea, extending the mindfulness meditation into your life off the mat and further filling yourself with vitality.